For the character from the TV series The Nanny, see Sylvia Fine (The Nanny). 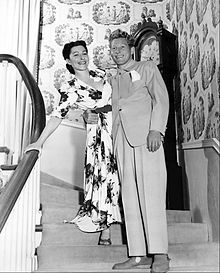 Sylvia Fine with husband Danny Kaye, 1945. Sylvia Fine (August 29, 1913 – October 28, 1991) was an American lyricist, composer, and producer, and the wife of the comedian Danny Kaye. She and her future husband grew up within blocks of each other in Brooklyn, but they did not meet until 1939. Sylvia Fine was born in Brooklyn, New York, the youngest of three children of a Jewish dentist, and raised in East New York. She attended Thomas Jefferson High School and studied music at Brooklyn College, where she wrote the music for the school's alma mater, with lyrics from the poet Robert Friend. She was working as an audition pianist when she met Danny Kaye; both were working on a short-lived Broadway show. Fine wrote the lyrics and music for it. Although the pair had never met before, they discovered something in common. Kaye had once worked for Fine's father, watching his office while the dentist went to lunch. Dr. Fine had fired his future son-in-law for doing woodworking with his dental drills. They married on January 3, 1940. He proposed on the telephone while working in Florida; Fine was in New York. She made the trip to Fort Lauderdale where they were married. Promotional flyer for The Straw Hat Revue, 1939. Fine met her future husband, Danny Kaye, while working in it. She took a direct role in managing her husband's career and wrote many of his songs for him, both in film and recordings. Those for the film The Court Jester were co-written with Sammy Cahn. She was an associate producer of some of the films. Fine received a Peabody Award in 1980, and during her career she was also nominated for two Oscars and two Emmys. She began working in television production with her husband's 1960s television shows. The New York Times reported, "In the 1970s, [Fine] embarked on a separate career as a television producer and teacher. She began teaching musical comedy at the University of Southern California in 1971 and at Yale in 1975. In 1979, she produced and narrated the course as a 90-minute PBS programme, Musical Comedy Tonight (eventually a three part series), which won a Peabody Award. In 1975 she was executive producer for a television special, "Danny Kaye: Look in at the Met." She produced and edited Assignment Children, a UNICEF film that starred her husband." In the last three years of her life, she had been writing an autobiography, Fine and Danny, about her life with Kaye for Knopf Books. Fine and Kaye had a daughter, Dena (born December 17, 1946). They separated in September 1947, attributing the separation to "two people working very hard." They reunited 7 months later, and remained married until his death in 1987. Sylvia Fine Kaye died of emphysema at the age of 78 in her Manhattan apartment in 1991. She is buried with her husband at Kensico Cemetery in Valhalla, New York. In 1992, her daughter Dena Kaye was quoted in a newspaper article, recalling Fine's advice to her and the influence it had in her life. Both Fine and Kaye were determined not to influence their daughter's choices as she grew up. In a 1954 interview, Kaye stated that "Whatever she (Dena) wants to be she will be without interference from her mother nor from me." Dena grew up to become a journalist. The careers of Fine and Kaye are immortalized in The Danny Kaye and Sylvia Fine Collection at the Library of Congress. The materials preserved in the collection include manuscripts, scores, scripts, photographs, sound recordings, and video clips. ^ "Sylvia Fine". Internet Movie Database. Retrieved December 1, 2010. ^ a b "A team grew in Brooklyn". The Dispatch. April 25, 1975. Retrieved March 10, 2011. ^ Boyle, Hal (August 27, 1959). "Composer Sylvia Fine Can Write Anywhere Anytime". The Sunday News-Press. Retrieved November 27, 2010. ^ Hyman, Paula E.; Moore, Deborah Dash, eds. (1997). Jewish Women in America: An Historical Encyclopedia, Vol. 1: A-L. Routledge. p. 880. ISBN 0-415-91934-7. Retrieved March 11, 2011. ^ a b c d e "Movie producer, songwriter Sylvia Fine Kaye dies at 78". Daily News. October 29, 1991. Retrieved November 27, 2010. ^ Jaynes, Gregory (May 14, 1988). "About New York; Noteworthy Improvement On School Song". New York Times. Archived from the original on July 14, 2012. Retrieved November 27, 2010. ^ a b c d "Who Is Sylvia?". Pittsburgh Post-Gazette. October 30, 1960. Retrieved January 18, 2011. ^ a b Battelle, Phyllis (May 8, 1959). "Mrs. Danny Kaye Proves a Genius". The Milwaukee Sentinel. ^ "Kaye at the Met". The Evening News. April 25, 1975. Retrieved November 27, 2010. ^ Adir, Karen, ed. (2001). The Great Clowns of American Television. McFarland & Company. p. 270. ISBN 0-7864-1303-4. Retrieved January 18, 2011. ^ "Git Gat Gittle". Time. March 11, 1946. Retrieved January 14, 2011. ^ Wilson, Earl (July 2, 1959). "It Happened Last Night". The Morning Herald. p. 4. Retrieved January 8, 2017 – via Newspapers.com. ^ Raymer, Dorothy (November 6, 1945). "Who Is Sylvia? What Is She?-Danny Kaye's Inspiration". The Miami News. ^ a b Hyams, Joe (February 16, 1960). "Film Lyricist Sylvia Fine Top Hand With a Rhyme". The Montreal Gazette. Retrieved November 27, 2010. ^ Morehouse, Rebecca (July 23, 1979). "Her Life Is O-Kaye". The Deseret News. Retrieved March 10, 2011. ^ "Sylvia Fine Kaye's 'Musical Comedy Tonight'". The Evening Independent. February 11, 1981. Retrieved November 27, 2010. ^ "Mudd, Trout Win Peabody Awards". The Milwaukee Journal. April 20, 1980. ^ Sharbutt, Jay (April 24, 1975). "Danny Kaye's 'Look In' A Delightful Program". Lewsiton Evening Journal. Retrieved January 15, 2011. ^ a b Grimes, William (October 29, 1991). "Sylvia Fine Kaye, 78, Songwriter; A Proponent of Musical Theater". The New York Times. Archived from the original on July 13, 2012. Retrieved January 15, 2011. ^ Cheney, Carlton (October 26, 1947). "The Secret Life of Danny Kaye". The Milwaukee Journal. ^ Handsaker, Gene (December 11, 1947). "Like Peas in Pod Are Film Married Duos". The Deseret News. Retrieved January 18, 2011. ^ Nemy, Enid (March 15, 1992). "Mother's Words Are Never Forgotten". Gadsden Times. Retrieved March 10, 2011. ^ Perry, Lawrence (May 9, 1954). "Danny Kaye Looks At Life". The Milwaukee Journal. ^ Boyd, Joseph G. (May 23, 1980). "Travel writer attends party saluting hotel". The Milwaukee Sentinel. ^ "The Danny Kaye and Sylvia Fine Collection: About the Collection". American Memory. The Library of Congress. Retrieved July 13, 2016. This page was last edited on 2 April 2019, at 22:54 (UTC).